Schools Out For Summer | Burnham Opportunity Box (BOB). 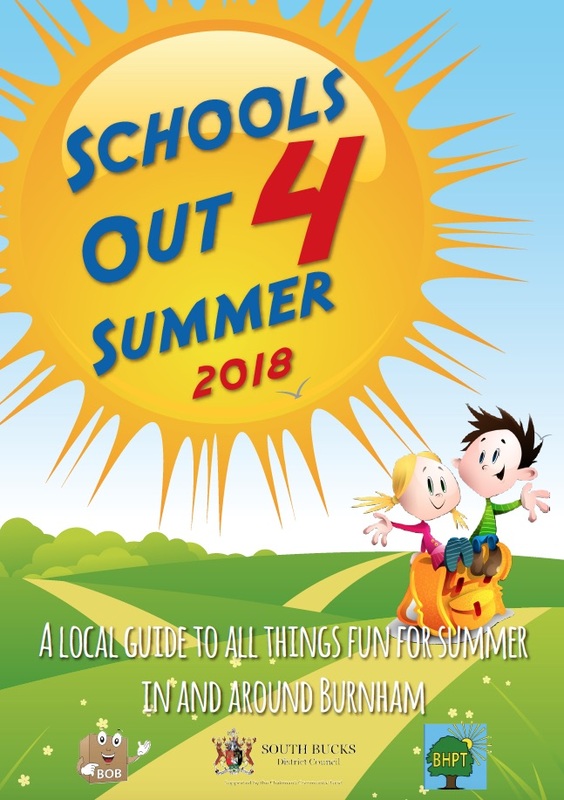 On this page you will find information about all sorts of events and activities taking place during the 2018 summer holidays. We have listed activities for each week and towards the back of the booklet you will find a list of anytime activities. The majority are local to Burnham but we have also included some activities from slightly further afield. Summer Reading Challenge 2018 launches on Saturday 14th July. The theme this year is ‘Mischief Makers’ to coincide with The Beano’s 80th anniversary. Suitable for children aged 4 -11. Children will be asked to choose 6 books to read over the summer, collecting stickers along the way. Medals and certificates will be awarded to those that complete the challenge. Register with Burnham Library to get your reading pack. Burnham LighthouseMonday 30th July – Friday 3rd August. Lighthouse is a Christian run holiday club for children aged 4 -11years. Also volunteering opportunities for young people & adults. Prior booking is essential and may be closed by the time of publication. Check with website for more details. Timbertown 2018This year’s theme is ‘Timbertown Down Under’. It is aimed at children between 6-11 years and registration takes place on Saturday 14th July 9am-12pm at Desborough Boys School, Maidenhead. The cost is £30 for the 4 days - Saturday August 25th – Tuesday 28th August. Prior booking is essential. Timbertown urgently need young helpers/adult volunteers, so please get in contact if you can support them via email Timber.town@yahoo.co.uk Please check website for further information. Burnham Village Fete Organised by the Burnham Community Association this village event will take place just before the school holidays on Saturday 14th July in Burnham Park, 12pm-4pm. The theme this year is ‘A celebration of our emergency services’ with vehicles & representatives from the police, the ambulance service, and fire service. There will be a BBQ, refreshments, beer & prosecco tent, Sports demonstrations, Lions Train, ‘Mischief Makers’ Fancy Dress competition for kids, prize draws and much more. Black Park‘Superhero’s Picnic’ Tuesday 19th July 11am-12.30pm in Black Park Country Park, Black Park Road, Wexham Slough SL3 6DS. Come as your favourite superhero from Iron man to Captain America and join us for some super fun and games in Black Park with your toddlers. Please remember to bring your own picnic and superhero outfit or toy, because we need as many heroes as possible! Meeting point: Black Park Visitor Centre (a short walk from the public car park). Online booking essential / family friendly / weather dependant. £3.50 per child. Parking charges will also apply. Maidenhead Festival Saturday 21st & Sunday 22nd July 2018. From 10.00am until late at Kidwells Park in Maidenhead. Main stage music all day, circus shows, festival beach, fun fair & kids zone, fireworks, performance art & volunteer fair. Parking is restricted around the park. Free entry to all. Fun for all the family! Colne Valley Festival 2018 Sunday 22nd July 11am-4pm at the Colne Valley Park Visitor Centre, Denham Court Drive UB9 5PG. (If arriving by car use Old Mill Road, UB9 5AR off A40 Oxford Road & follow arrows to Priory Meadow) Attractions include; Live music, Dog show, Circus Skills, Duck Racing, Face painting, funfair, River Dipping, Arts & crafts, Beer tent, hot food, Ferret racing, exhibition stalls and lots more! Free entry to all. Parking charges will apply (£3.70 all day) strictly disabled-only parking on Denham Court Drive car park. Be Happy Day Nursery Summer Club Based in Burnham Football Club, Wymers Wood Road, Burnham, SL1 8JG. The Be Happy Nursery are opening their doors for a summer club to children ages 2-5years. Activities include cooking, arts & crafts, sports etc. This week the club is open Wednesday 25th to Friday 27th July. Sessions are 9am-12pm cost £20, 12pm-3pm cost £20 or 9am-3pm cost £40.00. Children should take a packed lunch and wear appropriate clothing. For more information, contact Nicky Rowe on 01628 662789 or email managerburnhamdaynursery@behappypreschool.co.uk Booking is essential. 10.45am - 12.45pm. Nature based fun and craft activities aimed at children aged 4-12. Suggested donation. Suitable for all the family, prams and wheelchairs included. No dogs at this event. Get Active Sports @ Lent Rise School Monday 23rd July - Friday 27th July. This club is solely for Children of Lent Rise School, Burnham. Get Active camps promise fun and imaginative sports sessions combined with challenging games, activities and themed art and craft. Cost is; 8am-6pm £28.95 per day or £130 Mon-Fri block booking. 8.30am-3.30pm £24.95 per day, 9.30am-3.30pm £19.95 per day or £90 Mon-Fri block booking, 9.30am-6pm £26.95 per day. Book on-line at www.getactivesports.com. For more information see the website or email at info@getactivesports.com or telephone 01344 860868. The Greatest Showman, Outdoor Cinema Hosted by Firefly Events & Wellington Country Park, this popular musical film will be screened on Friday 27th July at Wellington Country Park, Odiham Road, Riseley, Reading. RG7 1SP. Doors open at 19.30pm and the film will start at 21.00pm. Refreshments available to purchase on site. Costs £8.80 for a child ticket, £13.20 for an adult ticket. Family tickets £41.80 (2 adults/2 children) Discounts for Early bird booking with tickets as low as £6.60. Booking on-line required. Be Happy Day Nursery Summer Club Based in Burnham Football Club, Wymers Wood Road, Burnham, SL1 8JG. The Be Happy Nursery are opening their doors for a summer club to children ages 2 - 5years. Open Monday 30th July to Friday 3rd August. Sessions are 9am-12pm cost £20, 12pm-3pm cost £20 or 9am-3pm cost £40.00. Children should take a packed lunch and wear appropriate clothing. For more information call Nicky Rowe 01628 662789 or email managerburnhamdaynursery@behappypreschool.co.ukBooking essential. Shining Star ProductionsPresent their summer workshop, Disney’s ‘Tangled- A play in two days’ Monday 30th July & Tuesday 31st July. 9.00am-5.00pm. Suitable for children aged 3-13 years, the workshop is held at Burnham Park Hall, Windsor Lane, Burnham, SL1 7HR. Parking available for drop off & pick up. Cost £49.00 for the two days. Children should take a packed lunch, plenty to drink, enrolment form and wear comfortable old clothes that you don’t mind getting messy as set painting will be included. Booking is essential as only 30 places are available. Visit website for booking and enrolment forms or call Amanda on 07842 018049 for more information. Burnham Library Teddy Bears Picnic Tuesday 31st July at 2pm, Windsor Lane, Burnham SL1 7HR. Free of charge. Free parking available on-site or in nearby Burnham Park Hall car park (register inside at reception). Children must be accompanied by an adult. Don’t forget your Teddy Bear!! Cliveden NT The Midnight Gang! Thursday 2nd August 1.30pm or 5pm. Heartbreak Productions present a brand new production of David Walliams book. Cost Adult £16.50 Child £10 (Entrance to Cliveden may be additional) Free parking on site. Booking essential. Call 0344 249 1895 or book online. Get Active Sports @ Lent Rise School Monday 30th July-Friday 3rd August. This club is solely for Children of Lent Rise School, Coulson Way, Burnham. Get Active camps promise fun and imaginative sports sessions combined with challenging games, activities and themed art and craft. Cost is; 8am-6pm £28.95 per day or £130 Mon-Fri block booking. 8.30am-3.30pm £24.95 per day, 9.30am-3.30pm £19.95 per day or £90 Mon-Fri block booking, 9.30am-6pm £26.95 per day. Booking essential. Book on-line at www.getactivesports.com. For more information see the website or email at info@getactivesports.com or telephone 01344 860868. Get Active Sports @ Priory School, Slough Monday 30th July – Friday 3rd August Priory School, Orchard Avenue, Slough. SL1 6HE. Get Active camps promise fun and imaginative sports sessions combined with challenging games, activities and themed art and craft. Costs are; 8.30am-3.30pm £24.95 per session, 08.00am-6.00pm £28.95 per session or £130 Mon-Fri Block booking, 09.30am-3.30pm £19.95 per session or £90 Mon-Fri Block booking, 09.30am-6.00pm £26.95 per session. Booking essential. Book on-line at www.getactivesports.com for more information email at info@getactivesports.com or telephone 01344 860868. Be Happy Day Nursery Summer Club Based in Burnham Football Club, Wymers Wood Road, Burnham, SL1 8JG. The Be Happy Nursery are opening their doors for a summer club to children ages 2 - 5years. Open Monday 6th August to Friday 10th August. Activities include cooking, arts & crafts, sports etc. Sessions are 9am-12pm cost £20, 12pm-3pm cost £20 or 9am-3pm cost £40.00. Children should take a packed lunch and wear appropriate clothing. For more information, contact Nicky Rowe on 01628 662789 or email managerburnhamdaynursery@behappypreschool.co.uk Booking is essential. www.participant.co.uk/BurnhamGymnasticsClub/summercamp or visit the website. Please email burnhamgymnastics@hotmail.co.uk with any queries. Sports Nuts Cricket Club A great way to hone your cricket skills and make some new friends. Monday 6th August –Friday 10th August 10am-3pm at Wooburn Narkovians Cricket Club, Wooburn Green HP10 0PN. Suitable for children in school Years 1- 6. Cost is £36 per day and includes all food. Bring your own cricket kit if you have it but otherwise supplied. Plenty of free parking for drop off & pick up at Wooburn Park carpark at the bottom of Wash Hill (just walk across the park to the pavilion). Booking essential. Burnham Library Comic Strip Day! – Would you like to be a Mischief Maker or a Super Hero? If so, come along to the Burnham Library ‘Make a comic strip Day’ on Wednesday 8th August at 10.30am, Windsor Lane, Burnham SL1 7HR. Tickets are £1 each. Free parking available on site or in nearby Burnham Park Hall car park (register inside at reception) Children must be accompanied by an adult! More details from Burnham Library. SL6 0NS Saturday 11th August 12-5pm. Fun for all the family including bouncy castles, Tag rugby, Face painting, DJ, BBQ, Beer tent, community stalls & much more. Free entry although there will be charges for certain attractions. Be Happy Day Nursery Summer Club Based in Burnham Football Club, Wymers Wood Road, Burnham, The Be Happy Nursery are opening their doors for a summer club to children ages 2 - 5years. Open Monday 13th August to Friday 17th August. Activities include cooking, arts & crafts, sports etc. Sessions are 9am-12pm cost £20, 12pm-3pm cost £20 or 9am-3pm cost £40.00. Children should take a packed lunch and wear appropriate clothing. For more information, contact Nicky Rowe on 01628 662789 or email managerburnhamdaynursery@behappypreschool.co.uk Booking essential. Morning; wildlife walk - bug hunts, games and fun in the woods. Suggested donation £2. Booking required. Afternoon; 2.30 - 4pm; if you can’t make the morning or just want even more fun, drop in for an afternoon of nature-based fun and craft activities at the Information Point aimed at children aged 4-12. Suitable for prams and wheelchairs. No dogs at this event. Suggested donation £2. Parking charges may apply. Burnham BeechesMeet the Ranger and the bugs and beasties! Wednesday 15th August 10.45am - 12.30pm. One of the Rangers will be showing off some of the fabulous creepy crawlies that live in the woodland. Parking charges may apply. Suitable for prams and wheelchairs. Parking charges may apply. Get Active Sports @ Priory School, Slough Monday 13th August – Friday 17th August. Priory School, Orchard Avenue, Slough. SL1 6HE. Get Active camps promise fun and imaginative sports sessions combined with challenging games, activities and themed art and craft. Costs are; 8.30am-3.30pm £24.95 per session, 08.00am-6.00pm £28.95 per session or £130 Mon-Fri Block booking, 09.30am-3.30pm £19.95 per session or £90 Mon-Fri Block booking, 09.30am-6.00pm £26.95 per session. Booking essential. Book on-line at www.getactivesports.com For more information email info@getactivesports.com or telephone 01344 860868. Maidenhead at the Movies The 17th & 18th August sees the return of the very popular Maidenhead at the Movies. Set up in Kidwells Park, all films are free to watch. Four films will be shown each day. Titles to be announced nearer the time. Check press for details or visit @enjoymaidenhead Facebook page. Thames Valley Police Open Day Thames Valley Police Annual Open Day will be held on Saturday 18th August at the Training Centre at Sulhamstead House, in Sulhamstead, near Reading, RG7 4DX. Open from 10.00am to 4.00pm, entry is free and suitable for all the family. See the police helicopter & team, meet the mounted & dog sections and tour the Police Museum. Limited parking is available on site but there is disabled access & parking available. Strictly no dogs admitted except assistance dogs. Food available to purchase on site, but cash only accepted. See website for more information. Be Happy Day Nursery Summer Club Based in Burnham Football Club, Wymers Wood Road, Burnham, The Be Happy Nursery are opening their doors for a summer club to children ages 2-5years. Open Monday 20th August to Friday 24th August. Activities include cooking, arts & crafts, sports etc. Sessions are 9am-12pm cost £20, 12pm-3pm cost £20 or 9am-3pm cost £40.00. Children should take a packed lunch and wear appropriate clothing. For more information, contact Nicky Rowe on 01628 662789 or email managerburnhamdaynursery@behappypreschool.co.uk. Booking essential. Burnham BeechesWoodland Wonders go wild day Wednesday 22nd August Morning; Wildlife Walk - bug hunts, games and fun in the woods. Suggested donation £2. Booking required. Afternoon; 2.30 - 4pm; if you can’t make the morning or just want even more fun, drop in for an afternoon of nature-based fun and craft activities at the Information Point aimed at children aged 4-12. Suggested donation £2. Suitable for all the family, prams and wheelchairs. No dogs at this event. Parking charges may apply. www.participant.co.uk/BurnhamGymnasticsClub/summercamp or visit the website. Email burnhamgymnastics@hotmail.co.uk if you have any queries. Get Active Sports @ Priory School, SloughMonday 20th August - Friday 24th August. Priory School, Orchard Avenue, Slough. SL1 6HE. Get Active camps promise fun and imaginative sports sessions combined with challenging games, activities and themed art and craft. Costs are; 8.30am-3.30pm £24.95 per session, 08.00am-6.00pm £28.95 per session or £130 Mon-Fri Block booking, 09.30am-3.30pm £19.95 per session or £90 Mon-Fri Block booking, 09.30am-6.00pm £26.95 per session. Booking Essential. Booking essential. Book on-line at www.getactivesports.com. For more information email info@getactivesports.com or phone 01344 860868. The History on Wheels MuseumMonday August 27th – see entry above for details. Be Happy Day Nursery Summer Club Based in Burnham Football Club, Wymers Wood Road, Burnham, The Be Happy Nursery are opening their doors for a summer club to children ages 2-5years. This week the club is open Tuesday 28th August to Friday 31st August. Activities include cooking, arts & crafts, sports etc. Sessions are 9am-12pm cost £20, 12pm-3pm cost £20 or 9am-3pm cost £40.00. Children should take a packed lunch and wear appropriate clothing. For more information, contact Nicky Rowe on 01628 662789 or email managerburnhamdaynursery@behappypreschool.co.uk Booking essential. www.participant.co.uk/BurnhamGymnasticsClub/summercamp or visit the website or email burnhamgymnastics@hotmail.co.uk if you have any queries. Get Active Sports @ Priory School, Slough Tuesday 28th August – Friday 31st August (No club on BH Monday) Priory School, Orchard Avenue, Slough, SL1 6HE. Get Active camps promise fun and imaginative sports sessions combined with challenging games, activities and themed art and craft. Costs are; 8.30am-3.30pm £24.95 per session, 08.00am-6.00pm £28.95 per session, 09.30am-3.30pm £19.95 per session, 09.30am-6.00pm £26.95 per session. Booking essential. Book on-line at www.getactivesports.com for more information email info@getactivesports.com or telephone 01344 860868. Sports Nuts Cricket Club A great way to hone your cricket skills and make some new friends. Tuesday 28th August – Friday 31st August 10am-3pm at Wooburn Narkovians Cricket Club, Wooburn Green, HP10 0PN. Suitable for children in school Years 1-6. Cost is £36 per day and includes all food. Bring your own cricket kit if you have it but otherwise supplied. Plenty of free parking for drop off & pick up at Wooburn Park car park at the bottom of Wash Hill (just walk across the park to the pavilion). Booking essential. Burnham Beeches On location Sunday 2nd September. Join a 2-hour guided tour of one of the most popular film locations in the country to see where Harry Potter, Robin Hood and James Bond were filmed. Booking is essential. Suitable for families but not prams or wheelchairs. Dogs on a lead welcome. Burnham Parks and playgroundsBurnham has some great parks that are all free and open every day. The Stomping Ground, St Peter’s Recreation Ground and Hag Hill Playground all have children’s play equipment and Burnham Park has the outdoor gym, table tennis tables, a multi- use games area and play equipment. Table tennis bats and balls can be borrowed from Burnham Park Hall and Burnham Library. a summer trail aimed at children up to the age of 12. Just pick up a leaflet from the information point and guide yourself along the route. Don’t forget your pencil! Suggested donation of £2. Suitable for all the family & abilities and dogs on a lead. Parking charges may apply. Outdoor wildlife park with birds and animals and all sorts of attractions for children and families including miniature train, indoor and outdoor play areas, paddling pool, displays of model boats and treasured toys. Open 7 days a week 10am to 6pm over summer. Adults £11 Children £9 Under 2’s free. Some concessions. Also a discount if you book online 48 hours in advance. For more information call 01189 767480 or visit website. Dorney Court House & Gardens This local Tudor house & gardens will be open every afternoon throughout August between 1.30pm & 5.00pm. Entrance prices are from £5.50 for children, £8.50 concessions and £9.00 for adults. Please check the website before embarking on your journey as the house is often used for filming or weddings so tour schedules may be changed at short notice. Please see website for more information including carers/group leader discounts, disabled access & parking. Kidwells Park, MaidenheadBath Road, Maidenhead, SL6 8AQ. Park suitable for all ages including play equipment for 3 - 8yr olds, Matrix skate park for older children for skate, skate boards, BMX etc., sports courts for tennis, basketball, netball & football (equipment not supplied). Other amenities include public toilets, a seasonal refreshment kiosk and seating/picnic areas. The park is FREE for all to use. Buggy & wheelchair friendly. Parking available. Locks Ride Beach Play area Locks Ride Recreation Ground, Forest Road, Winkfield Row, RG42 7NJ. Beach themed sand area, water splash pad and play areas. Play areas are open from 10am and splash pad 11am-1pm and 3pm-5pm daily. The Cabin is open daily for refreshments and ice creams etc. FREE entry. Maidenhead Beach at Norden Farm Altwood Road, Maidenhead SL6 4PF.The Hawaiian Elvis Themed Beach is back and will be open from Tuesday 26th July to Sunday 4th September Parents relax in the beachside café whilst your little one plays in the sand! Join in arts and crafts or storytelling sessions in the specially designed story den or try some indoor surfing courtesy of green screen technology! Family films screened throughout the summer (See website for more information). Free tropical juice drinks for children between 10.30am-11.15am (subject to availability) Free colouring & activity sheets. Norden FarmAltwood Road, Maidenhead SL6 4PF ‘Beach Life’ from Monday 23rd July through to Sunday 2nd September. 10.00am -10.30pm A special installation designed to be a relaxing sensory delight for everyone, inspired by the beach huts of Goa, featuring work created by local schools. Get involved in designing (on the floor) and making fluttering kites which we’ll fly over the summer. This is a FREE event! Odds Farm Park Wooburn Common, HP10 0LX.Animals, indoor and outdoor play areas and amazing summer adventures with The Oddsocks Family returning, bringing with them themed shows, arts & crafts and summer time games. This runs from the 21st July to 2nd September. Open 7 days a week – 10.00am to 5.30pm. See website for more information. Book on-line or buy tickets at door. Summer holiday charge £15.95 per person. Under 2’s free. Blue Peter Badge owners can gain free entry into over 200 Blue Peter Badge attractions around the country such as theme parks, zoos and castles. Visit the Blue Peter website for details as to how you can win your own badge! Families OnlineDetails of events and activities for families and children happening all around the UK. Search by postcode/ type of activity etc. Every effort has been made to ensure prices & dates are correct at time of publication. BHPT & BOB take no responsibility for date, time & price changes made by the individual or event organisers.